Today, around 10,200 thrombectomies are performed in the US, 7,500 in Germany and 3,500 in France. Thrombectomy is a revolutionary stroke treatment where the offending clot is literally sucked out of the patient’s brain. I performed my first thrombectomy in 2006, but I remember it as though it was yesterday. I was working as a junior doctor in the catheter laboratory (“cathlab”) at Saarland University Hospital in Germany when a call came in from Professor Klaus Fassbender, the head of the neurology department. He told me that a 42-year-old soldier had just been admitted, suffering from a severe stroke. “He can’t speak or move his right arm or leg,” Fassbender said. The soldier, a passionate marathon runner, had collapsed at home. His wife brought him to the hospital where he was given the clot-busting drug, rtPA. Although the drug was administered in the critical golden hour following the start of the stroke, it hadn’t helped. “Perfect. We will bring the patient down to the cathlab,” Fassbender said. “And, by the way, you have to speak English to his wife. She’s American.” Great, I thought. Exactly what I need. I’d heard that Americans are much more likely to sue their doctors if treatments didn’t go to plan. A few minutes later, the soldier’s wife confronted me. She wanted to know if the device we were proposing to use to remove the clot out of her husband’s brain had been approved by the US Food and Drug Administration (FDA). I told her it wasn’t even CE marked. It was part of a trial that I was involved in. But I said she could talk to the inventor of the device for advice while we performed the procedure. We made a small incision near the patient’s groin and fed a catheter along the aorta, into the carotid artery in his neck. Then we introduced the suction catheter (the “vacuum cleaner”), which was fed inside a larger catheter. With the help of a guide wire, we manoeuvred the suction catheter into the brain until it was in front of the thrombus (clot) that was blocking the middle cerebral artery, a large blood vessel in the brain. At the start, we were anxious because we didn’t know if it was possible to navigate a catheter of this size into a cerebral artery. But now we were there, in front of the thrombus. Everybody in the room had their fingers crossed. We pressed the button to switch the suction device on. At first, nothing happened. Then suddenly the clot was pulled into the tube and then blood started coming through. We knew we had opened something, so we injected a contrast dye into the blood vessel via the catheter to get a better view of the fluoroscopy (medical imaging that shows a continuous X-ray image on a monitor). Everything was clear. We couldn’t believe it. We were still concentrating on the amazing fluoroscopy images when we were distracted by the patient; he was waving, asking if we were done yet. The patient was nearly dead one minute, and the next minute fully recovered with all his symptoms reversed. We couldn’t believe how fast the change occurred. We were ecstatic. We performed the procedure on a Tuesday. The patient discharged himself on Thursday, against the will of the doctors, and completed a marathon on the Saturday. This type of ischaemic stroke, where a major blood vessel is blocked by a clot, results in a vegetative state or death about 60% of the time. For the lucky ones, recovery is slow, arduous and partial. But now we have a powerful new weapon in our arsenal: thrombectomy. Today, around 10,200 thrombectomies are performed in the US, 7,500 in Germany and 3,500 in France. But in the UK only 600 thrombectomies are performed each year. About 15m people worldwide have a stroke each year and 5.8m people die from it. It is one of the biggest causes of disability. There are two main types of strokes: haemorrhagic stroke, where there is bleeding in the brain, and ischaemic stroke, where an artery that supplies blood to the brain becomes blocked, causing permanent damage to brain tissue. About 80% of strokes are ischaemic strokes. Until a few years ago, the only treatment for ischaemic stroke was thrombolysis. This is where a clot-busting drug is delivered to the site of the stroke via a catheter in an attempt to dissolve the thrombus. Thrombolysis tends to only work for smaller clots. Thrombectomy is more effective at treating larger clots. If someone has a clot in the brain, we don’t know if it’s a white clot from atherosclerotic plaques in blood vessels or a red clot from the heart. You never get to touch a clot or see what it is, but with thrombectomy you do. The clot in our first patient, the American soldier, was shiny yellow. We sent the pea-sized thrombus to the histology department, which confirmed that it was pure fat. This type of clot is very unusual. We later discovered that the patient had a problem with his lymphatic duct. One role of the lymphatic system is to absorb fats and transport them to the venous circulation, but in the patient, the fats were transported to his heart. And from his heart, a fat clot was pumped into his brain. Anticoagulant drugs such as warfarin, which prevent the formation of blood clots in the heart, have no effect on this type of clot. Before thrombectomy, we had no way of knowing what type of clot a stroke patient had. Now we can often see where the clot is coming from and we can tailor the medication to it. Without this knowledge, our first patient would have been on a high-dose blood thinner for the rest of his life, suffering the side effects, such as bruising, nausea, vomiting and stomach pain, but with no benefit. In our the first year of doing thrombectomies at Saarland University Hospital, we performed about 100 procedures, including in children. Usually, children are excluded from stroke studies as it is very expensive to get approval for a new drug or device in children. But if you have a potentially life-saving treatment and there is no other option, what do you do: treat or not treat? My first child patient was a boy of about eight years old. He was in a bad way. Three of his arteries were blocked: a neck artery (the carotid), the middle cerebral artery and the artery that supplies blood to the whole front part of the brain, the anterior cerebral artery. His stroke wasn’t diagnosed immediately – most people don’t suspect stroke in children – so he only came to us three hours after his stroke had started, and he was severely disabled. But, following treatment, he made a good recovery. Of course, thrombectomies aren’t for all types of stroke. They mainly benefit patients who have a big clot in one of the main arteries that feed the brain. About 10-20% of people with ischaemic stroke could benefit from thrombectomy, and about half the people who are treated make an excellent recovery. The management team at Southend University Hospital was keen to set up a thrombectomy unit. They had sensed that this new procedure was going to be a big thing, even though there was no solid evidence from randomised controlled trials to confirm their hunch. But they are a pioneering hospital – they were among the first hospitals to use thrombolysis in England. When I received their invitation, I didn’t even know where Southend was – I had to look it up on a map. And then I read about the other things this small hospital had done and their huge motivation to do the best for their patients, and I knew this was for me. Our first patient was a young woman. I received a text at two o'clock in the morning to say she had been brought to the hospital. This was the team’s first actual thrombectomy patient. Up until then, we had only used the technique on a simulator. To my surprise, when I arrived at the hospital, the whole team was there, waiting to start. Everyone who had been there for the training had come in, voluntarily; they all wanted to see the treatment and see if it worked. The treatment was a success. Within ten minutes, the patient was wide awake and able to talk, but I wasn’t happy with her speech. “It’s probably because I’m German,” the patient said. There was nothing wrong with her speech, she just had an accent. We laughed about this and began chatting in German. In 2014, I conducted a study in the UK, investigating the outcomes of severe stroke patients who were untreated. I found that 60% of the patients died or were severely disabled as a result of not receiving treatment. About 80% of the patients had a bad outcome. The most severe cases – the patients with the worst outcomes – are the ones who would benefit most from thrombectomy. If you look at it from a health economics standpoint, these patients will cost hundreds of thousands of pounds a year, every year they are alive. And that’s without factoring in the anguish for the family and the disaster for the patients themselves. Stroke does not just happen in the old – my youngest stroke patient was two-and-a-half years old. And, of course, the longer you live, the more you cost. In terms of loss of productivity, it’s about £100,000 a year, and the cost is even higher if the patient has to be on a ventilator. Our second thrombectomy patient at Southend had an occlusion of the basilar artery, the artery that supplies the brainstem. In this artery, the opening success rate of clot-busting drugs is only about 4%. 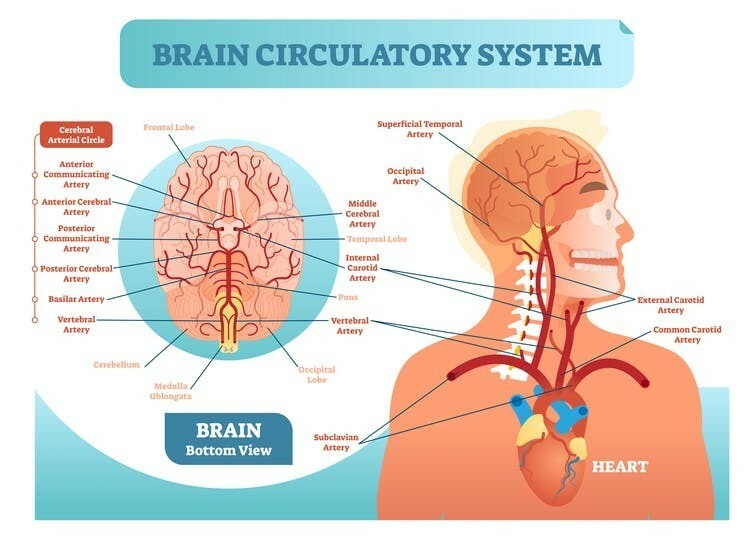 These patients either die because the artery involves the brainstem and breathing function, or they have something that is arguably worse than death: locked-in syndrome. Locked-in syndrome means you are awake, but you cannot breathe, and you cannot communicate. The only thing you can do, sometimes, is blink. This patient could only move her eyes from side to side – not even up and down. That was the only function of her brainstem that remained. We discharged her three days later. Without the thrombectomy, she would have been in a locked-in state. Instead, she went home in the same state she had been in before the stroke. Despite the life-changing benefits of the procedure, there are only 22 centres in the UK that perform it. One of them is Southend-on-Sea, where the procedure has been performed since 2013. We are currently the only district general hospital in the UK providing a thrombectomy service. In an effort to allow more stroke patients to benefit from the treatment, ttreatment, the UK’s National Institute for Health and Care Excellence (NICE) recently announced that it is extending the eligibility period for thrombectomy from 12 hours to 24 hours. Paul Chrisp, director for the centre for guidelines at NICE, said: “New evidence shows that extending the eligibility period of thrombectomy to up to 24 hours can be very cost-effective.” But it’s not that simple. Each minute that treatment is delayed results in 2m brain cells dying. Although the human brain has about 100 billion brain cells, losing hundreds of millions of brain cells in a critical part of the brain can have a devastating effect. While I welcome NICE’s decision to increase the timeframe for treatment, especially in patients who have a stroke while they are asleep (where the time of onset is unclear), it has to be understood that this does not mean that the clock has stopped and thrombectomy can now be delayed for hours, or that patients can be safely shipped to distant specialist centres. There is also no evidence to suggest that thrombectomy should be performed at a neurosurgical or neuroscience site, as NHS England is proposing. In fact, only 30% of the hospitals in the seminal study from the Netherlands that provided the evidence to perform thrombectomy, had a neurosurgery department. In the worst-case scenario for an ischaemic stroke (a perforated blood vessel), the interventionist needs to deal with the situation on site and at once (inflating a balloon in the vessel to stop the bleed or, as a last resort, blocking the vessel). There is no situation where neurosurgery would be immediately possible. Even if there was a neurosurgeon brave enough to perform open-brain surgery on a patient with thrombolysis, they would not be able to fix a punctured blood vessel or even find the hole. There is, however, plenty of evidence that stroke treatment is time dependent and that transfers are associated with the worst outcomes. Researchers in the US also found that transfers from another facility were associated with higher hospital costs. The UK’s demographics and geography require that stroke treatment takes place as close to onset as possible. Well over half the population lives in rural areas where there are no thrombectomy centres. The development of thrombectomy is similar to what we saw in the treatment of heart attacks 20 years ago, and lessons can be shared. The data is clear: thrombectomy must be performed as soon as possible to get the best results. “Time is brain”, as people in the profession say. The effectiveness of thrombectomy is beyond doubt and is unmatched by any previous therapy in stroke medicine. Ultimately, it is the well-being of patients that should guide our decision. For many patients, rapid access to thrombectomy will determine the difference between death or disability and living a normal life. The number of strokes is far too great and not in locations where neuroradiologists work, so we need to develop a larger workforce involving other interventionists, such as cardiologists. The UK is now taking action and creating more thrombectomy centres. This will be achieved in both neurosurgical and non-neurosurgical settings. But we need to work together, overcoming turf wars between specialities, to provide fast treatment and better outcomes. If we do this, the future for stroke victims will be positive. This article is published in collaboration with The Conversation.